Augusta Emerita (Merida) was the administrative and military center of the Roman province of Lusitania. Nowadays, the city holds many Roman monuments and treasures. 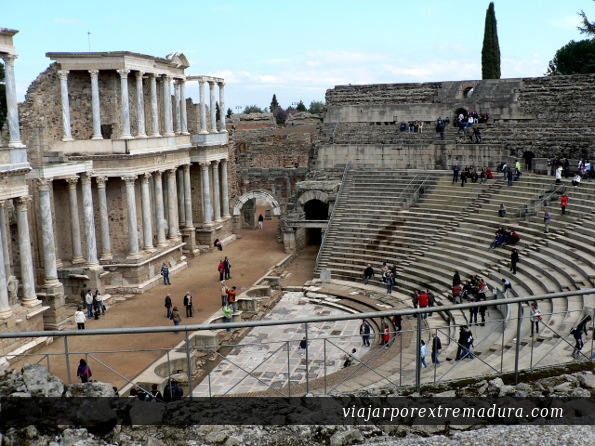 Merida is a World Heritage City, and has the most important set of Roman ruins of Spain: the Roman Theater, Amphitheatre, Circus, Trajano’s Arc, Aqueducts, Roman houses..
Near Merida is the beautiful Natural Park of Cornalvo where you can practice hiking or birdwatching. In this park is located a Roman dam (more than 2000 years old) that is in use today. Another Roman dam, Proserpina, is also near Mérida. If you come in summer, you can enjoy a night in the Roman theater as the Classic Theater Festival take place annually in July and August. The Christian Easter celebration in Merida is also very appreciated.